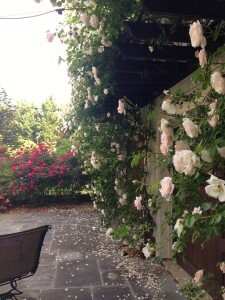 During the month of May, our back courtyard is the site of a rose explosion. First the red roses along the fence pop. Then the pale pink climbers on the garage trellis follow suit. Each year our family marvels. We can’t believe these roses. I’ve written about the evolution of the space behind our house from cement wasteland to cozy enclosed garden. See Up From the Concrete, Roses. When I looked back at the photos from that 2012 post, I was surprised to see just how much the roses have multiplied in three years. On the last Saturday in May we hosted a gathering and hit the weather just right. The evening was pleasantly warm. We were on the porch or in the courtyard from beginning to end, surrounded by roses. Several friends asked how quickly they grew. 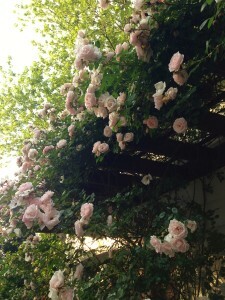 How long did it take the pink roses to reach the top of the trellis? Seemed like two years, but I wasn’t sure. So I looked back. The changes were dramatic. This is the way the roses grew. The porch addition, the courtyard and lawn panel, and the changes to the garage were completed in May 2009. Most of the plantings were in just before Memorial Day. 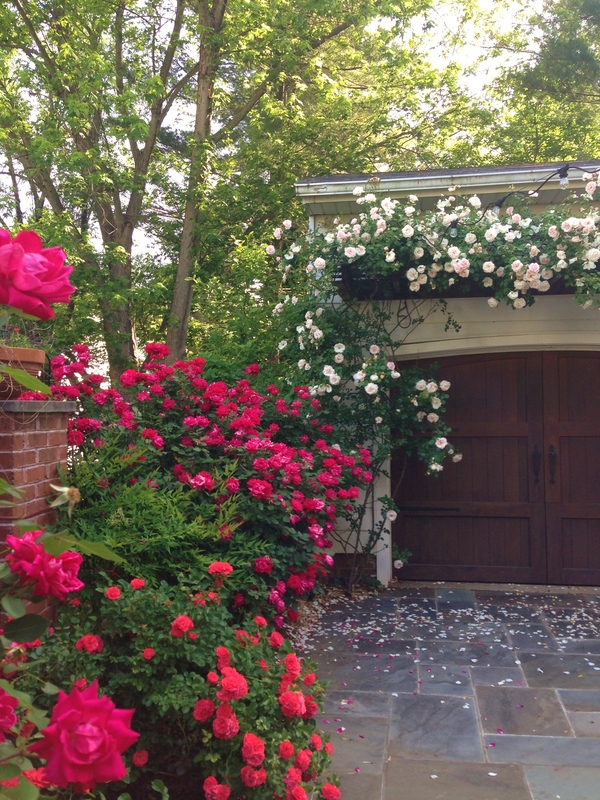 The climbing roses, each shrub almost two feet in height, were planted at the sides of the garage and between the doors. 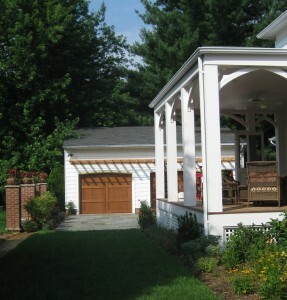 The above photo shows the porch without screens and the yard as yet unfenced. 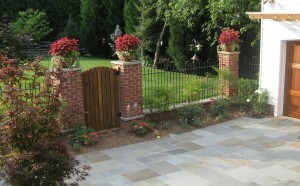 Along the fence line, we alternated red rose bushes with taller nandina. 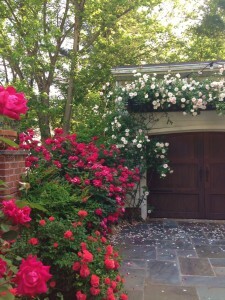 We didn’t realize then how quickly the roses would overtake the nandina. 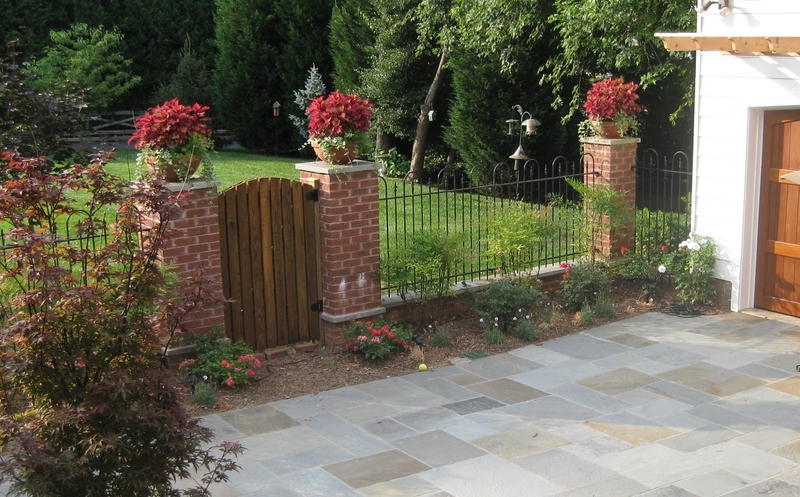 When the plants were first in, the transformation struck us as spectacular, a vision of instant lushness. Six years later, we’ve grown more accustomed to our leafy flower-filled courtyard, and I’m amazed at how relatively bare it all was back then. Hardly spectacular. So much of the iron fence plainly visible, the unadorned white glare of the garage and the stark, naked trellis. I also forgot how young our daughter was when we began the project. 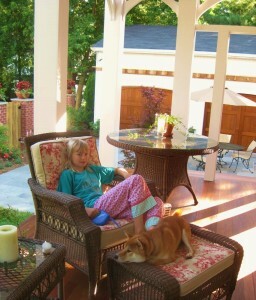 In this picture, from July 2009, she was ten and just out of fourth grade. Goodness, she looked like a little kid. Maybe because she’s our only child, and we tend to talk to her more or less as we would an adult, she’s always seemed relatively mature. I’ve never wanted to rush her growing up, but I generally think of her as older than she is. 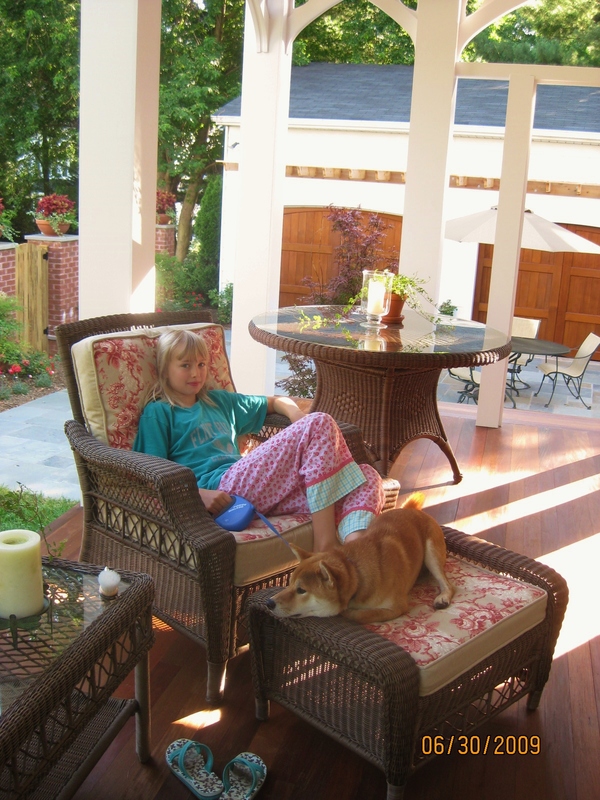 Yet on that summer morning in her PJs six years ago, she sure looked like a ten year old, with little-girl bangs and short hair. That was back when I still laid out her clothes every morning, when I could shop for her easily, when my mother would sew full-skirted Sunday dresses for her. Back before pierced ears, make-up and high heels, before she developed her own unique sense of style, very different from mine. Way before she needed a steady supply of long gowns for drama events and prom. That was my little girl. Wow. Kiko was nearly two. With relief I note that he looks exactly the same now as he did then. 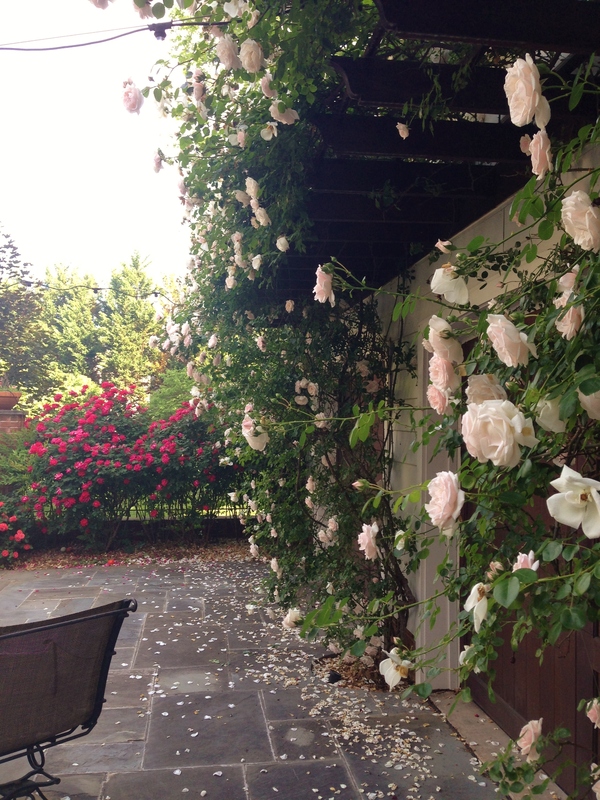 A year after planting, the climbing roses had nearly doubled in height, but were still a long way from reaching the trellis. The vines were spindly and thin. In this photo, taken in April 2010, our eleven-year old daughter models her classic (she would now call it old-fashioned and babyish) Easter dress. By July of that year, the red rose bushes were considerably denser and as tall or taller than their neighboring nandina. 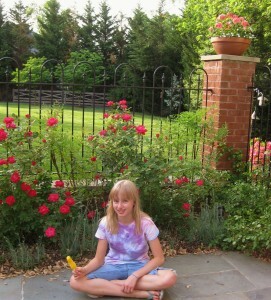 Our daughter, eating a homemade popsicle, wears the tie-dyed shirt she made for her fifth-grade production of Alice-in-Wonderland. Her hair still slightly wet from the pool, she was a typical, somewhat scruffy rising sixth-grader. I don’t remember it ever entering my mind that she was in an awkward stage. Hindsight is bracingly clear-eyed. 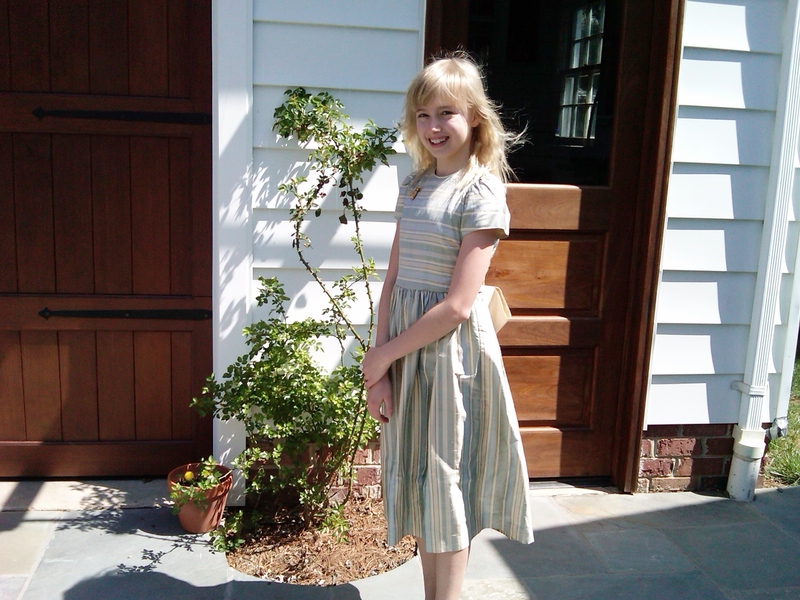 Still, compared to the less than stellar preteen me (with glasses that evoked the cartoon character Morocco Mole, braces and an unflattering short hair cut), my daughter at eleven was a personification of tween elegance and beauty. Much like our roses during their pre-adolescence. To be continued. Next up: Flowers and girl continue the climb.